T-12 displayed in the Artillery Museum in Saint Petersburg, Russia. Closeup of the T-12 aiming mechanism, with blueprints showing its proper lubrication in the background. 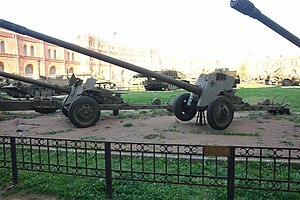 2A19 or T-12 is a Soviet smoothbore 100-mm anti-tank gun, which served as the primary towed anti-tank artillery in the Soviet and Bulgarian armies from the early 1960s to the late 1980s. The T-12 entered service in 1961, replacing the BS-3 100 mm field gun. It was typically deployed in the anti-tank units of armoured and motor rifle regiments to protect flanks against counter-attacks during rapid advances. In 1970, it was replaced in production by the T-12A or MT-12 "Rapira", which features a new smoothbore gun, the 100 mm 2A29 gun, as well as a redesigned carriage and gun shield to protect the crew from machine gun fire and shell splinters. Thanks to the redesigned carriage, which has a bigger wheel base, the MT-12 can be towed by the MT-LB, at speeds up to 60 km/h on road or 25 km/h cross-country. The 2A29R "Ruta" or MT-12R is a version with a RLPK-1 radar for engaging targets in a poor visibility environment (smoke/fog). From 1981, the gun could fire laser beam-riding guided missiles 9M117 Kastet (weapon system 9K116) and carried the new designator 2A29K "Kastet" or MT-12K. The weapon was planned to be superseded by the 2A45 Sprut-B 125 mm smooth bore anti-tank gun. Modern western tanks' frontal armour protection is in excess of what can be penetrated by a 100 mm gun from anything but point-blank range – even using the most modern APFSDS round. For a tank that can manoeuvre to take advantage of the enemy's weaknesses this is less of a problem – but for a weapon that is primarily defensive, this is a serious problem. Today, the T-12 is applied mostly in the role of ordinary artillery, using FRAG-HE shells. In 2017, the Algerian military displayed a locally developed variant mounted on a Mercedes-Benz Zetros truck. It includes four stabilization legs to absorb firing impacts. The gun requires a crew of six: commander, driver of the towing vehicle, gun layer, loader, and two ammunition crewmen. When the MT-LB is used as the transporter, 20 rounds are typically carried (10 APFSDS, 4 HE-Frag, 6 HEAT). Since the weapon is a smoothbore, all the ammunition is finned for accuracy during flight. The standard equipment consists of the panoramic PG-1M sight for indirect fire, and an OP4M-40U telescope for direct fire. The APN-5-40 or APN-6-40 are used for direct fire by night. The gun can be fitted with the LO-7 ski gear for travel across snow or swampy ground. Note: penetration numbers for RHA at 90 degrees. Beam riding laser guided projectile. Bulgaria: 200; 126 operational in 2016. Hungary: 106; 16 operational in 2009. Russia: 2,526; mostly in reserve. A407 - This artillery system was designed by Arsenal-Resita and is very similar to the MT-12. It can fire the same range of ammunition as the T-54/55 tank and has a maximum range of 2,200 m (HEAT) or 4,000 m (APC-T). Subversions are the A407M1 and the A407M2. In Romanian Army service, the A407 is known as the 100 mm anti-tank gun M1977 (Romanian: Tun antitanc calibrul 100-mm Model 1977) and is normally towed by the DAC 887R truck. It can also be towed with the DAC 665T truck. The Model 2002 is an improved version, fitted with the automatic fire control system TAT-100. Type 73 - This appears to be a copy of the Soviet T-12. Type 86 - This is a 100mm smoothbore anti-tank gun that has some similarities with the 85mm Type 56 (D-44). It fires ammunition of the fixed type, including the Type 73 HE, Type 73 HEAT, Type 73 APFSDS and Type 86 APFSDS to a maximum range of 1,800 m.
^ Zaloga, Steven; Luczak, Wojciech; Beldam, Barry (1992). Armor of the Afghanistan War. Armor 2009. Concord Publications. p. 67. ISBN 978-9623619097. ^ Mantoux, Stéphane (December 2012). "Jours de tonnerre : L'Armée russe au combat en Ossétie du Sud et en Géorgie" [Days of thunder: The Russian Army in combat in South Ossetia and Georgia]. Batailles et Blindés (in French). No. 52. Caraktère. pp. 68–82. ISSN 1765-0828. ^ a b c d e Foss, Christopher (1977). Jane's pocket book of towed artillery. New York: Collier. p. 55. ISBN 0020806000. OCLC 911907988. ^ Binnie, Jeremy (4 July 2017). "Algeria displays locally developed self-propelled artillery". IHS Jane's 360. Archived from the original on 6 July 2017. Retrieved 6 July 2017. ^ Nerguizian, Aram; Cordesman, Anthony (2009). The North African Military Balance: Force Developments in the Maghreb. Washington DC: Center for Strategic and International Studies Press. pp. 44–46. ISBN 978-089206-552-3. ^ a b c d e f g h i j k "Trade Registers". Armstrade.sipri.org. Retrieved 20 June 2013. ^ a b c d e f g "Future Artillery Systems: 2016 Market Report" (PDF). Tidworth: Defence IQ. 2016. Archived from the original (PDF) on 22 January 2018. Retrieved 21 January 2017. ^ "Bosnia Herzegovina Land Forces military equipment, armament and vehicles Army". Armyrecognition.com. Retrieved 15 October 2014. ^ Gribincea, Mihai (2001). 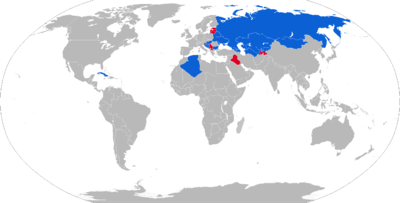 The Russian policy on military bases: Georgia and Moldova. Oradea: Editura Cogito. p. 223. ISBN 978-9738032200. ^ "United Nations Register of Conventional Arms: Report of the Secretary-General" (PDF). New York: United Nations. 14 July 2009. Archived from the original (PDF) on 20 June 2017. Retrieved 20 June 2017. ^ Zaloga, Stephen (2015). T-64 Battle Tank: The Cold War’s Most Secret Tank. Oxford: Osprey Publishing. p. 44. ISBN 978-1472806284. ^ "Lectures and General Exercises of the General Staff Academy of the Armed Forces of the USSR" (PDF). Langley: Central Intelligence Agency. 28 August 1977. Archived from the original (PDF) on 22 January 2017. Retrieved 20 May 2017. Wikimedia Commons has media related to 100 mm anti-tank gun T-12. This page was last edited on 5 March 2019, at 15:01 (UTC).